After many tense rounds the winner of the Dream Big competition was announced live on 89.5 FM on Friday during the breakfast show. The winner, who will record a professional demo with Dirty World Productions will hopefully go on to big things. Stay tuned to see when the winner will perform with Bush Radio’s own Shaz and Dirty Funk. Even though they were tense, the three finalists, Samantha, Ryan and Neviell performed a group song (CLICK HERE). After adding up the votes for the past week. Shaz eventually announced the winner who was Ryan Adams. We wish him well. 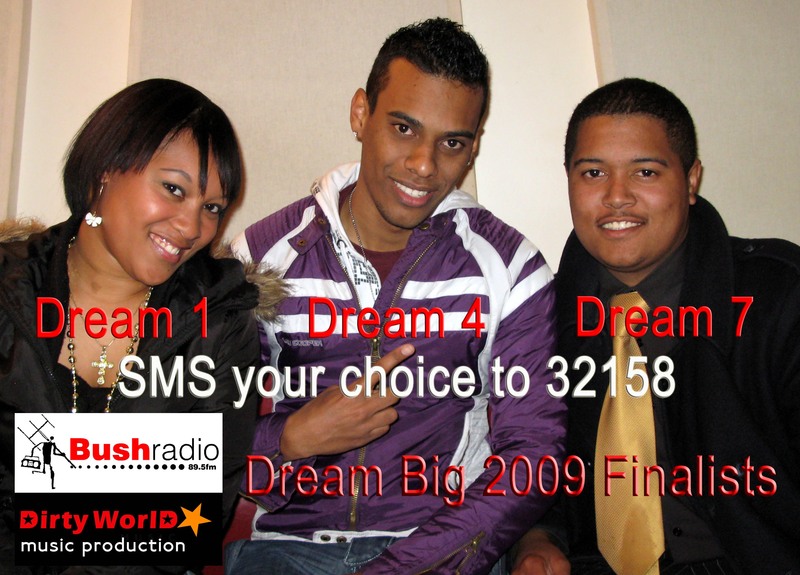 Check out the videos of the three finalists of the Dream Big competition and help them win. 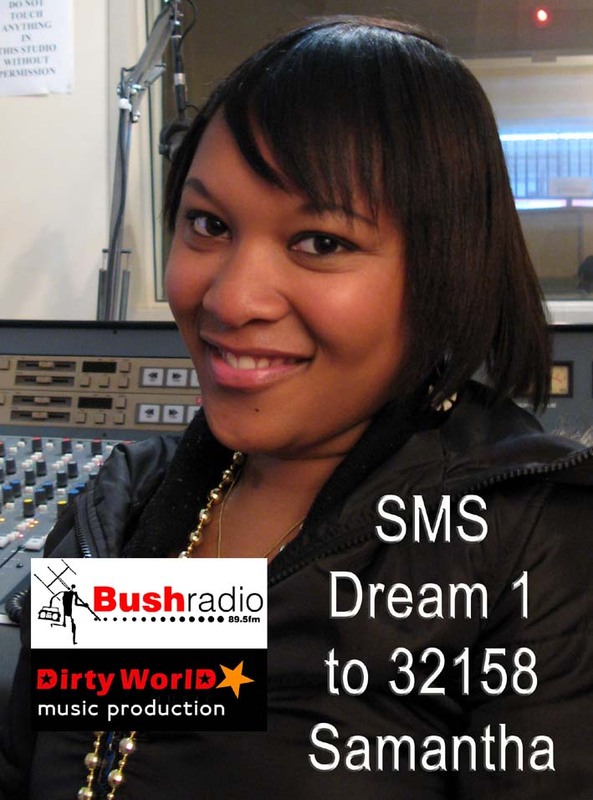 We down to the final phase of the Bush Radio / Dirty World – Dream Big competition. Who will win that demo recording with Dirty World? Will it be the sultry sounds of Samantha (Dream 1)? Will it be Ryan’s (Dream 4) flow? Or the smooth sounds of Neviell (Dream 7)? Click on the image and check out their videos, or visit Zoopy . Closing date is Friday 28 August 2009 at 08h00. To help Grade 12 learners prepare for the 2009 National Senior Certificate examinations, Bush Radio 89.5 FM together with the Western Cape Education Department (WCED) will broadcasting programmes focusing on examination subjects and examination techniques. Subject specialists will be in studio to answer your questions and help with subject content, examination techniques and study tips. Edited recordings of the broadcast will be available from the WCED e-learning website. Afrikaans Home Language, Afrikaans First Additional Language, English Home Language, English First Additional Language, Xhosa Home Language, Mathematics, Mathematical Literacy, Accounting, Life Sciences, Physical Sciences, History, Economics, Business Studies, Geography and Agricultural Sciences. In an effort to keep the winter chills away, Bush Radio together with PEP is giving 20 lucky listeners the opportunity to win a warm blanket. All you have to do to enter the draw is sms WARM followed by your name to 32158. Competition closes on the 21 August 2009 at 09h00 and the draw will take place at 10h00. Bush Radio 89.5FM will be hosting the Speaker of the Provincial Parliament, Mr Shahid Esau and various other members of the Provincial Legislature in a weekly discussion focusing on the issues of the Provincial Parliament. Come join us and talk directly to your representatives in the provincial government this Wednesday from 7 to 8 pm. Participate in the discussion by calling during the programme on 021 – 448 6266 or sms your comments or questions to 32158. Bush Radio 89.5 FM, Africa’s oldest community radio station project is offering local internships in its programming department for trainee producers. The internships run from September 2009 – January 2010 and are fulltime. The internship is voluntary with NO stipend/salary. The internship provides opportunities for the candidates to develop skills in media with a specific focus on radio broadcasting but will include areas of new media and television. Only shortlisted candidates will be contacted for the interview process.